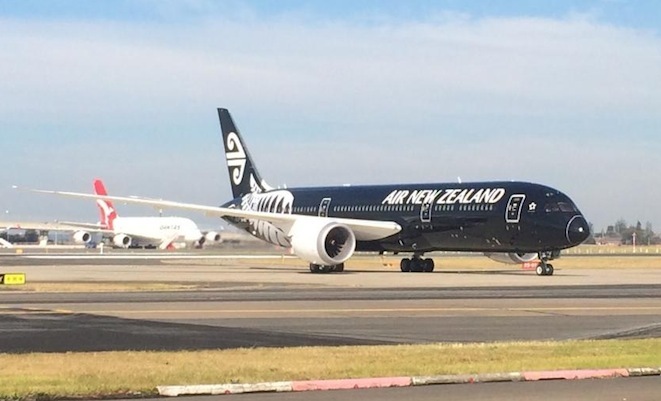 With little fanfare Air New Zealand operated its first Boeing 787 revenue flights on Saturday when 787-9 ZK-NZE operated NZ103 from Auckland to Sydney and the return NZ104 service back to Auckland. ZK-NZE departed Auckland at 09:25 local time, and despite fog at Sydney Airport earlier in the morning causing widespread delays and diversions, it was able to land essentially on time on Sydney’s Runway 34R at 10:30 local. The return flight then departed at Sydney at 13:09, landing at 17:45. Air New Zealand has 10 787-9s on order, with two more to be delivered this year allowing it to operate services from Auckland to Perth from mid October, and then to Shanghai and Tokyo by the end of the year. In the meantime the aircraft will regularly operate trans-Tasman services to Sydney as the airline builds up experience with the type. “We’ll operate Auckland-Sydney for a few weeks. That’s the optimum sector length to qualify our crews as fast as we can,” Air New Zealand’s director for aircraft programs, Kerry Reeves, told Australian Aviation last month. While the Kiwi flag carrier was the first airline to take delivery of the 787-9 it was pipped at the post for the honour of operating the world’s first 787-9 service, after ANA placed its first -9 (JA830A) into service between Tokyo Haneda and Fukuoka on August 7. I think this is a great looking areoplane,And as an expat Kiwi, It irks me a little bit to admit.But the Airbus 350 looks the goods in the visuality sector. What’s the deal with B787 engines only being painted white? ANA pipped Air New Zealand only because their pilots already had experience flying the smaller 787-8. It’s a stunning looking aircraft with an airline that knows what it is doing.